What a week it's been here in the United States! What a time of division and darkness we seem to be facing at the moment. We are just beyond the precipice of an unscripted future. It has been a difficult few days. Our shock and fear, however, at feeling the ground beneath us disappear and all else recede above us must turn to action. We must get our feet beneath us once again; we must reach out and look for one another amidst what feels like a free fall in utter darkness. Minds and hearts must be opened. We must step free of the echo chambers and enchanted mirrors with which we surround ourselves too frequently online and otherwise. We must choose to hear and see one another clearly, to understand that which we do not know, and to care for one another as best we can. One of the first things I did on Wednesday morning was to make some donations to causes that matter to me. These contributions were my way of acknowledging the far greater value that I feel these organizations represent and that we should never take for granted. My fearfulness receded a tiny bit when I realized that it is not only still possible, but completely crucial, to stand up for and stand alongside those whose wellbeing is challenged, whose visibility is endangered. Sharing what we have of time or other resources, giving recognition, and showing compassion--these are things we should strive always to do. Now, however, more than ever, they feel like at least part of the balm so many of us could use. Our feelings of vulnerability, invisibility, and fear can be transformed into opportunities to connect, to see, and to help. This all brings me to the reason for my post tonight. It is the eve of Veterans, or Armistice, Day, November 11th. This day has had a significance of many facets for me over the last five years of blogging here and the last several years of communing with the ghosts of 1914. As ever, the 11th is an opportunity to step outside of ourselves, our present time and circumstances, our everyday routines, and to recognize the sacrifices, stories, realities, and needs of those who have served their countries in uniform. To the men and women who have served in war- and peacetime, I give thanks. To my readers, I issue my usual encouragement to give thanks and support to veterans on this or any day. Some options for charitable giving are listed here. I have no affiliation with any particular charity or organization, but I hope that you take this opportunity to contribute time, a donation, or some other expression of care and recognition. This organization offers support and medical care for severely wounded service members and helps support military families. This organization offers military families temporary "comfort housing" where they can stay locally when loved one is being treated for injuries or illness. The British Legion provides "practical care, advice, and support" to serving military members, veterans, and families. Operation Homefront provides emergency financial assistance to military families. Homes for Our Troops assists severely injured/disabled veterans with necessary structural and other adaptations for their homes in order to support comfortable, accessible, and independent living. Having just gotten back from a trip to beautiful Los Angeles, it seems fitting to write about the silver screen tonight. Just recently, my husband and I sat down with some popcorn to watch Hell's Angels, Howard Hughes's 1930 epic about the Great War. I must admit, I was not sure what to expect of this film; though I was aware of its subject matter and some of the drama surrounding its production, I did not know much else about it. An episode of the excellent podcast, You Must Remember This, had rekindled our interest in the movie and we moved it to the top of our DVD delivery service queue. The confluence of modern technologies by which the film manifested in our living room seems a fitting frame for the viewing experience; Hell's Angels has an arresting freshness untroubled by the eight decades that stand between its making and modern viewers. Though it often gets rather short critical shrift, I am unconvinced by those who claim that the film's production history eclipses the movie itself. Hell's Angels features simply awe-inspiring aeronautical stunt sequences and a human drama mirrored by the incredible rise and fall of the flying machines that defy gravity and belief as they arc through the air...There are multitudes of details, themes, and other aspects that one might address in any critical take on this film. I'll focus this post on just a couple of them. I was just here! Well, in a way. 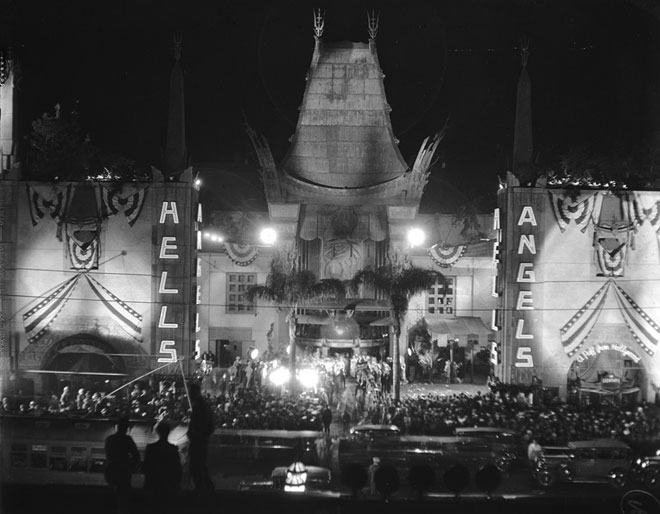 The Hell's Angels premiere at Grauman's Chinese Theatre, Los Angeles, 1930. While the film and its actors, for the most part, are American, the story is set in England and Europe. Both places are depicted in times of pre-war innocence and during the grimmer war years. In particular, however, the film anchors itself in an idealized England, a place and time seen as though through a pleasant (Hollywood-mediated) haze, with a sort of nostalgia or longing built into scenes of carousing university students and lavish parties. In the pre-war years, England represents a space of temporary union and friendship for the two British protagonists, Roy and Monte, and their university classmate, a young man summoned against his will to return home to Germany for military service near the film's beginning. The dreamy pre-war England of Hell's Angels is defined not only by ephemerality but by a chimerical evasiveness. The film suggests that this place might not exist at all. Like an illusion that lives only on the silver screen, Hell's Angels acknowledges that the England that means so much to some of its characters might be no more than the stuff of dreams. As various characters learn, just as soon as their desire for this place seems to shift to belonging, it--the old-world values, innocence, and the promises it seems to make--seems to disappear, leaving its would-be denizens heir only to a cold awakening, a rougher modernity. There is no explicit time travel in this film. However, just as it becomes difficult to separate the real from the imagined pre-war England, the past and the present--both the wartime present within the film and the post-war moment of the film's making--maintain a complicated entanglement throughout. Early in the film, a chivalric pistol duel is depicted in silhouette, abstracting the setting and characters to harken back to previous centuries. The scene precedes the war's advent in the film, but it foreshadows later encounters between two characters who represent not only opposing nations but generations locked into conflict. Some time later, a lovely color sequence depicts a ball given just as soldiers prepare to leave for war. Jean Harlow, who plays Roy's promised love interest but Monte's irresistible temptress, is dazzling in a gauzy chiffon and jeweled gown. She is a confident but self-absorbed character, resistant to the old-fashioned future to which she seems doomed because of her connection to the rather conservative Roy. While Roy seems to hail from an older world than his counterparts, Harlow's Helen is like a visitor from another time altogether, a kind of futuristic Hollywood yankee in King Arthur's court, if you will. Her modern sensibility distances her from both men, especially the idealistic Roy. She is unconcerned about her reputation amongst her fusty contemporaries or the degree to which they share her vision of the present and the future. As they register on film, Helen's appearance and attitude are rather jarring. She is not a particularly sympathetic character, but there is something perhaps compelling, or at least startlingly recognizable, in her manner and look. They appear out of time within the film; Helen seems aware that she does not belong to the world that surrounds her. In truth, she looks like she belongs in ours. Just as Roy and others long for an illusory past, Helen seems a harbinger of a world beyond the present, beyond the war. Helen looks forward, fearlessly. Her suitors see only a heavily mediated version of her--something angelic or devilish, held up only to the somewhat dim light of the present moment. I'll stop here for this evening. There is so much to say about this film! I'll follow up this post with another on the fascinating story of the Royal Flying Corps, whose history Hell's Angels prompted me to study. In an episode of the recent television drama, The Crimson Field, the three main characters, all young VADs, perform a song together for the benefit of field hospital patients and staff. The sweet and wistful song caught my attention and I decided to learn what I could about it. As it turns out, not only was "There's a Long, Long, Trail" a most popular Great War tune, but its history also traces back to one of my almae matres. The song was composed in 1913 by two Yale undergraduates, Alonzo Elliott and Stoddard King. The story goes that the two young men dreamed up the lyrics and melody one lazy afternoon on campus. Elliott and King were not soldiers, and the war had not even begun when they wrote this song. And yet, "There's a Long, Long, Trail" seems to have lent itself well to the experiences and sentiments of many of our ghosts of 1914, whether combatant or civilian. Full of gentle words of longing, the song contrasts a dreamy, moonlit, space that unites the singer and his or her love with the "long, long trail" keeping the two apart. A closeness, all too evanescent, is conjured up in memory and imagination, though reality sets "many a weary mile" between the two lovers. The song traces the singer's path from a point of loneliness at the far end of the trail to a hoped-for reunion in which the two lovers walk beside one another. Time and distance work against the singer and his or her love at first, constituting the arduous trail that separates them. Ultimately, however, the song suggests that time and distance (covered) are the very things that will bring the lovers back to one another. In the meantime, dreams will have to do. A soaring 1917 version by John McCormack, likely one that many of our ghosts of 1914 heard. A lovely, much later, 1940s rendition by the Sons of the Pioneers. I'll close here, hoping that you enjoy this sweet tidbit of Great War musical history. The war pigeon, Dreadnought, gazing rather lovingly into the eyes of a Royal Engineer. Part of the "Royal Engineers Signal Service on the Front, 1914-18" collection. The Ghosts of 1914 are here today to add to our little collection of pigeon posts. Previously, we've reviewed a bit of the history of Chere Amie, the brave messenger pigeon, and Martha, the last of the passenger pigeon species that was once enormously plentiful in the United States. For this pigeon series, I wanted to step back and get a better sense of the story of combat pigeons in the First World War. I've been filling in some answers to the who, what, where, why, and when questions with which I started my research. Slowly, but surely, I've drummed up some details on the history of combat pigeons in the Great War. I'll tell this story in parts; today's installation sets the stage with some essential background information. To start, Cher Amie and Martha were not members of the same species, in case you were wondering. Combat (sometimes called "messenger", which, as I'll explain later, doesn't really describe the extent of their combat roles completely) pigeons were, as far as I've been able to gather, strictly of the homing variety. --The Contributor, Nov. 1887, Vol. IX, No. 1. Homing pigeons are known and have long been bred for a remarkable ability to fly 'home', averaging impressive speeds and covering great distances. These birds are equipped with what seems an as-yet-not-fully-pinpointed biological navigational system that allows them, when released, to point themselves homewards and simply go! Some have speculated that the homing pigeon uses magnetic navigation, while others have pointed to a subtle innate sound-based biotechnology. Yet others have proffered a sense of smell as the reason for this bird's wondrous gift. The Belgian Concourse of 1818, where pigeons raced long distance from Toulouse, France, to Brussels. This inaugural race set off a passion for pigeon racing clubs and contests. Envelope used as part of the pigeon post preparation process to get messages into France. The Franco-Prussian war of 1870-71, during which pigeons were used in place of a disabled telegraph system to deliver thousands of messages to Paris. The Great Barrier Pigeongram service, begun in Auckland, in 1897. By the time of the Great War, homing pigeons were recognized for their speed, endurance, reliability, and efficiency as carriers for crucial information. This species was well-established as a viable communications option, particularly in conditions that made other technologies impossible. While some might consider pigeons a rather rudimentary system alongside such contemporary communications tools as radio and telegraphy, I'm learning that the art and science of pigeon messaging was just as sophisticated, complex, and daring as any others. In fact, as recently as 2009, a homing pigeon beat a South African DSL service in a (rather amusing) data transfer contest. Messenger pigeons show us that modern machinery does not always outperform a bit of ingenious collaboration between the human and animal world. In our next posts, we'll dig into the nuts and bolts of pigeon training, transportation, and service on the Great War battlefront. Till then, we're sending this post off to wing its way to you.